Happy Halloween Kitty Princess by Maria! 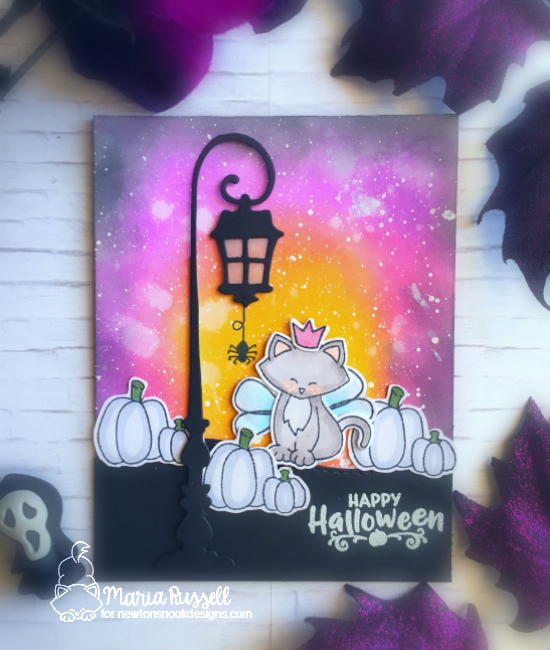 On this sweet Halloween card Maria uses several of our Halloween themed stamp sets to create a wonderful spooky scene! She dressed the kitty in a princess costume using the wings and princess crown from the NEW Newton's Costume Party Stamp Set. She colored the cute kitty and trimmed out the images using the coordinating Newton's Costume Party Die Set. The cute clusters of grey pumpkins were created using the pumpkin image from the Fall-ing for You Stamp Set. She added the kitty and pumpkins to this adorable card with a gorgeous inked background. She added black hills using the Land Borders Die Set and embossed the "Happy Halloween" sentiment from the Creepy Cameos Stamp Set in the lower corner! So cute! She even added a little spider from the Newton's Perfect Pumpkin Stamp Set, making his way down from the lantern! Great card with a stunning background ! What an amazing and lovely scene! The background is so dreamy! Love it!! !